This is simple, beautiful and wonderful game is created for both kids and adults. Fairy-tale forest with amazing insects and a fairy that move like real; unique music, sounds and astonishing graphics will not leave you uninterested. 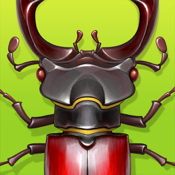 Catch insects, earn points and use those points to get more insects and bonuses. Give your child an iPhone or iPad and get back to your work. Large button Play Again in the Baby Mode will help your child to start a new game without referring to you.